In the late 1990s, the renowned Brazilian photographer Sebastião Salgado and his wife Lélia Deluiz Wanick Salgado initiated a project that aimed at restoring the natural state of a subtropical rainforest area. 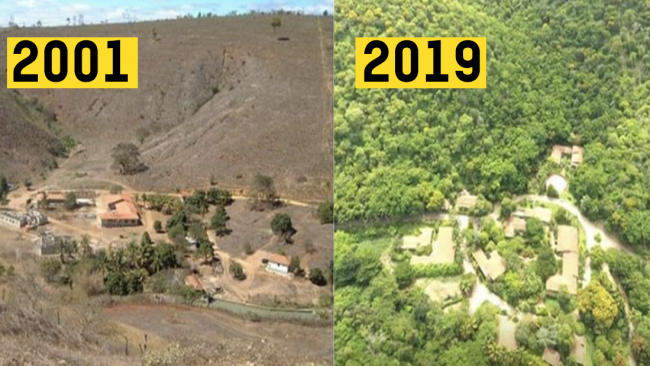 They took over a former cattle ranch near the town of Aimorés, in Brazil’s state of Minas Gerais, after he found that it looked nothing like he remembered it as a child since the trees were cut down and the wildlife has disappeared. In 1994, after returning from a traumatic assignment reporting on the genocide in Rwanda, he was devastated to find out that the tropical paradise he knew once was now gone. The Salgado family recruited partners, raised funds and, and founded the Instituto Terra in 1998. 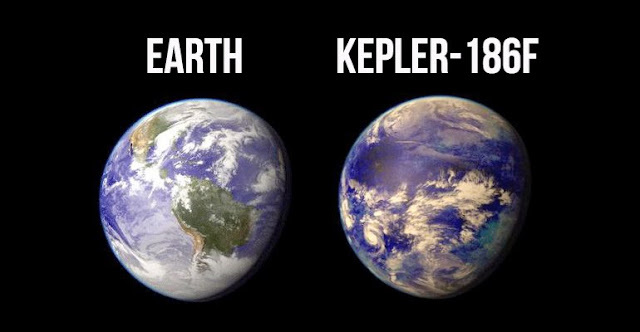 They managed to transform the environment and planted more than 2 million trees. 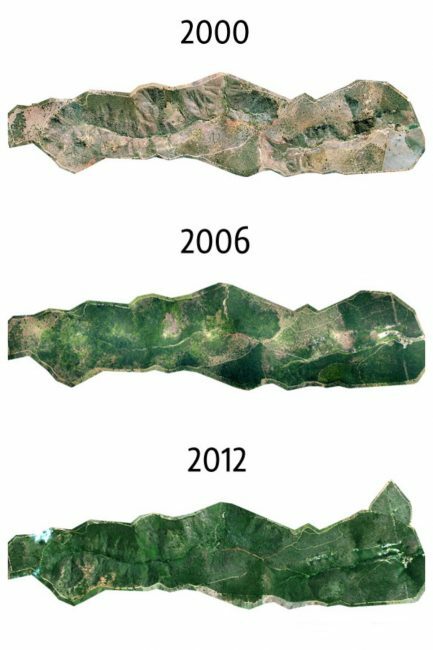 The aim of the Instituto Terra was to recover the 1,502 acres of rainforest in the Bulcão Farm in Aimorés, Minas Gerais. The Salgado couple saw the institute as a beacon that could raise awareness of the need to restore and conserve forest land. Their farm was completely devastated when, in 1998, it received the title of Private Natural Heritage Reserve (PNHR). In December 1999, the first trees were planted, and since then, year after year, with the support of important associates, they planted more than two million seedlings of over 290 species of trees, and thus recreated a forest of arboreal and shrub species native to the Atlantic Forest. Since the couple was aware of the importance of research and education for their goals, on February 19, 2002, the Instituto Terra created the Center for Environmental Education and Restoration (CERA), which would contribute to the process of environmental restoration and to the sustainable development of the Atlantic Forest, especially the Basin of the River Doce. The center shared new technologies that would improve the existing models of development. By December 2012, more than 700 educational projects had been developed, involving 65,000 people in over 170 municipalities of the Valley of the River Doce, covering both the states of Espírito Santo and Minas Gerais. 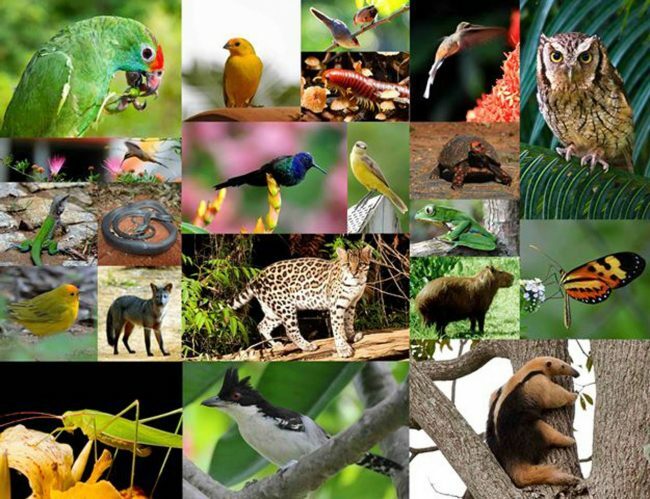 These projects led to the return of fauna, 172 species of birds have been identified, six of which are in danger of extinction, 33 species of mammals, two of which were classified as ‘vulnerable’, as well as 15 species of amphibians; 15 species of reptiles; and 293 species of plants. Nowadays, just 10% of the farm remains to be restored, but the goal of the project is to increase the numbers of native Atlantic Forest species and genomes in the area. Moreover, the erosion of the soil was stopped, so the water resources of the ram were revived. The eight natural springs on the farm have been come alive and flow at a rate of some 20 liters (5.3 gals) per minute, even in the case of drought. Since the area was planted with native tree species, it has become a forest of high biomass and diversity. More than four million seedlings of the multiple species native to Brazil’s Atlantic Forest have been raised in the institute’s own nursery. Those plants are now reforesting what was long known as the Salgado family’s Fazenda Bulcão, or Bulcão Farm, and are also contributing to similar environmental restoration programs in surrounding areas. Once in a state of advanced natural degradation, this former cattle ranch has been transformed into a fertile woodland, alive with flora and fauna which for millenniums had made the Atlantic Forest one of the world’s most important repositories of natural species.